Chubbsafes 4½" Vault Door embodies state of the art manufacturing technology and incorporating the latest developments in barrier materials. Both the door and boltwork have the capability to resist and protect against various methods of attack. 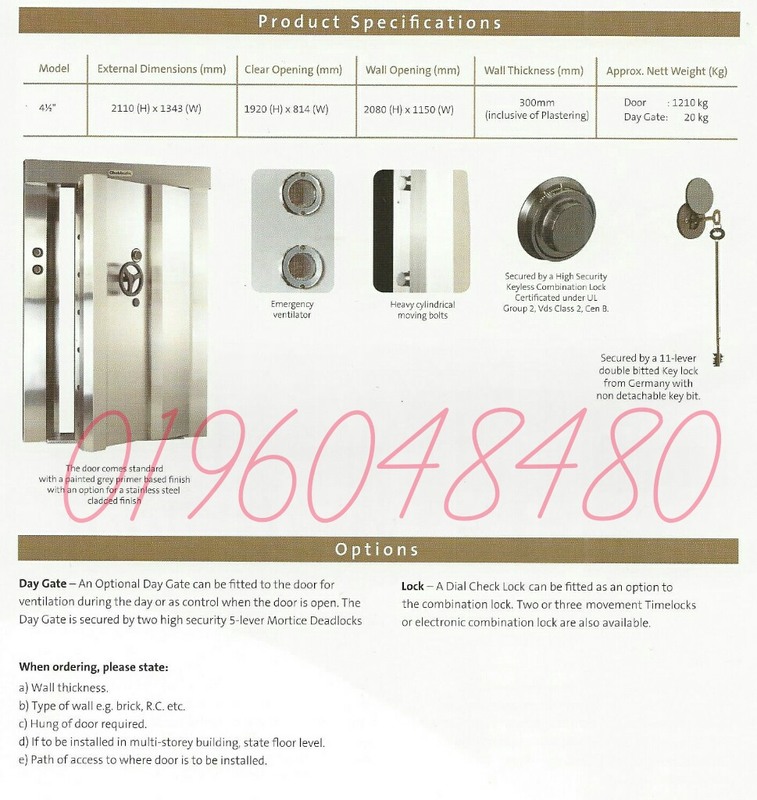 It also forms a notable distinction as one of the most widely used Vault Doors in high-risk security application. Door - Solid door slab with a protective thickness of 114mm (4½") forms the basis of the door which has an overall thickness of 251mm. Filled with a specially formulated F80 barrier material reinforced with steel fibers provides resistant to high speed drilling, oxy-acetylene cuttings and jack attacks. 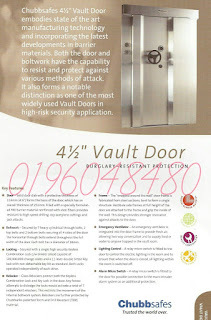 Boltwork - Secured by 7 heavy cylindrical through bolts, 2 top bolts and 2 bottom bolts securing all 4 sides of the door. The horizontal through bolts extend throughout the full width of the door. Each bolt has a diameter of 38mm. 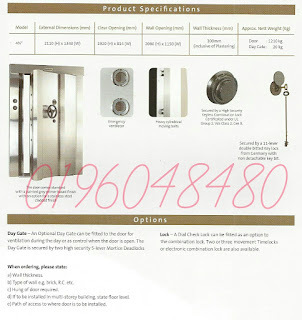 Locking - Secured with a single high security Keyless Combination Lock c/w blinder shield capable of 100,000,000 change codes and a 11-lever double bitted Key lock with non-detachable key bit as standard. Both Locks operated independently of each other. Relocker - Glass Relockers protect both the Keyless Combination Lock and Key Lock in the door. Any forced attempts to dislodge the locks would activate a total of 7 independent relockers. This restricts the movement of the internal boltwork system. 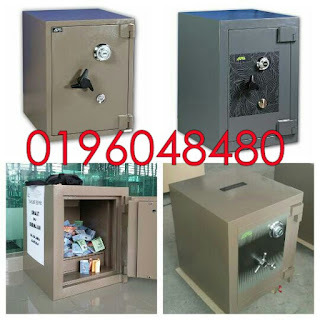 Relockers are further protected by Chubbsafes patented Torch and Drill Resistant (TDR) material. Frame - The " wrapped around the wall " door frame is fabricated from steel sections, bent to form a single structure. Vestibule side frames at full height of the door are attached to the frame and grip the inside of the wall. This design provides stronger resistance against attacks to the door. Emergency Ventilator - An emergency ventilator is integrated into the door frame to provide fresh air, allow two way conversation and to supply food or water to anyone trapped in the strongroom. Lighting Control - A relay micro switch is fitted to the door to control the eletric lighting in the room and to ensure that when the door is closed, all lighting within the room is switched off. Alarm Micro Switch - A relay micro switch is fitted to the door for possible connection to the main intruder alarm system as an additional protection.